I went to the mall last week and was in display envy at Pottery Barn. They have a new selection of blue and white and it was so pretty!Here are a couple pictures I took with my cell phone while I was there. Look at some of these pieces that yes, I will be adding to my blue and white collection! If you want to buy a whole 16 piece dinnerware set, this is the one! And look at this platter! 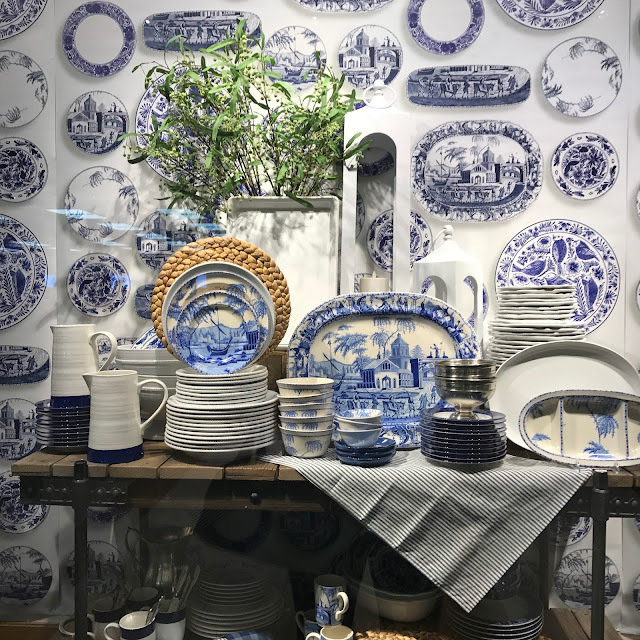 After shopping at Pottery barn I went next door to Williams Sonoma where I saw some more blue and white goodness. I snapped this quick picture of the table filled with blue and white and this brass chandelier that I have always wanted!